These are nice, solid straight tweezers. 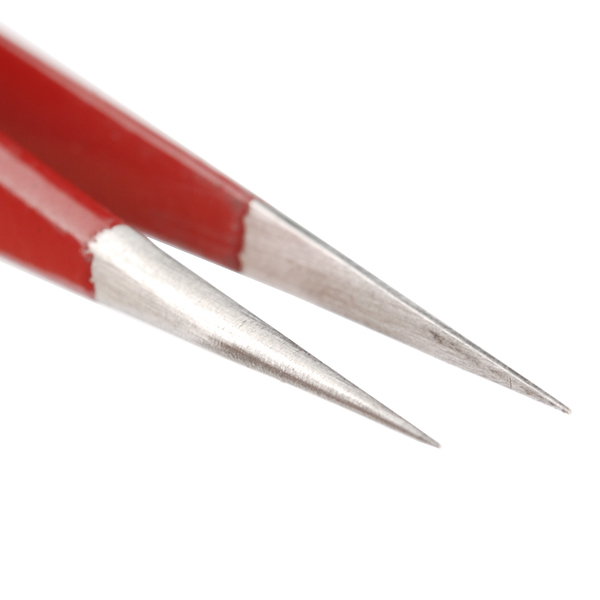 They have a very fine tip which allows you to pick up very small parts with precision. This is a great tool to have if you're working with surface mount components or anything with very small parts. The ESD-safe coating will also help prevent electro-static damage to sensitive electronic components. The best part? They're bright red and have the SparkFun logo printed right on them! 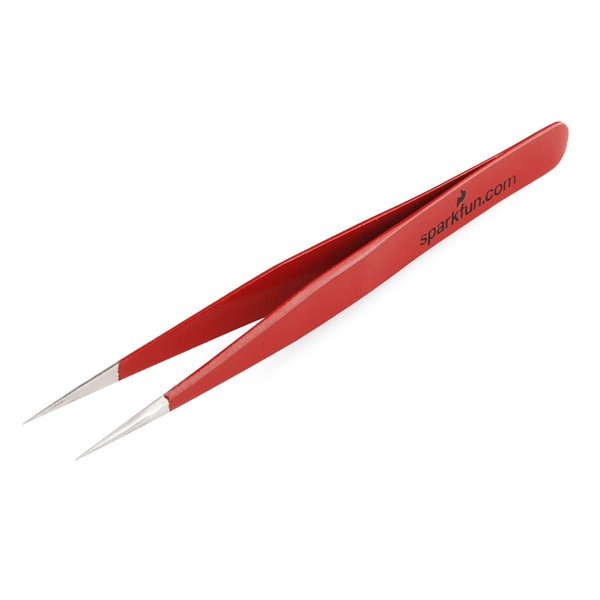 Are the handle bodies of these wider than the blue TOL-09226 tweezers? They look like it in the pictures, but maybe not. I believe they are, however, I can not proove this because we no longer carry the blue tweezers. Are the two halves electrically connected? 'Cause if not, then I see a super-cheap tweezer multimeter in the making! did you made it ? This tool is great from removing Integrated Circuits (ICs) from prototyping tools (like breadboards) and IC sockets. A must have for working on electronics. Cons: Upon arrival, a bit of the red paint on the handle was chipped off. This did not effect the operation of the tool, and I am still very happy with it. Great tweezers with a very fine tip! I love these tweezers so much I've bought 3 pairs! I love how fine tipped they are and I haven't owned any tweezers with such a small tip previously. I would recommend these to a friend and will buy them again when I inevitably misplace the ones I currently own.